Do you or your friends have some of the following experiences? You must read this article now. These are the symptoms of dry and dehydrated skin. But dry and dehydrated skin can be two different conditions. Dry skin refers to skin that is lack of oil, the natural protective layer of our skin is disappearing. Dehydrated skin is defined by lack of moisture in the epidermis. Oily skin can experience dehydration. 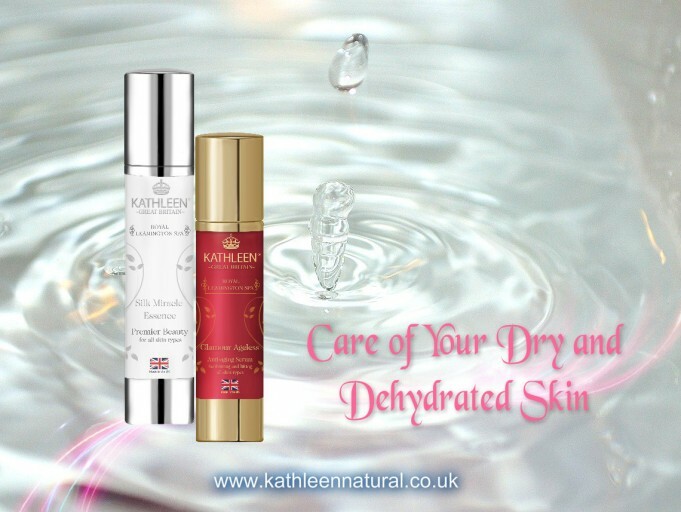 The main causes of dry and dehydrated skin likely are some of them. At age around 30, the sweat and the oil glands are less productive. This causes dry, wrinkled and itchy skin. At age around 40, the dermis and the skin’s fat layer start getting thin and so our skin dry out quickly. You must select an anti-aging serum with finest plant oils and moisturizing function when we are approaching 30. Don’t be lazy and apply it continuously. Now try Kathleen Glamour Ageless, you will feel the benefits on your face. Over exposure to the sun, winds, air conditioning, heating and low temperatures cause water loss from your skin much quicker than you can imagine. Your skin deteriorates quickly, becoming fragile and irritated, and even flaking if you do not break the cycle with an effective moisturizer. You shall always be gentle with your skin, protecting your face from external environment stress. Don’t wait for breakouts, prevention is always better than cure. Feed your face with Kathleen Silk Miracle Essence every day. Diets – Nowadays, fat-free diets is welcoming. But you have to be careful because extreme fat-free diets may hurt your body due to lack of essential fatty acids. This deficiency can result in itching, dryness, scaling, and thinning. Sleep – Missed sleep also hurt. While you sleep, all hormonal and metabolic changes happen in your whole body, including growing, repairing and restoring skin cells. A bad sleep, your face and eyes will tell people immediately. So please give your skin a 7-9 hours sleep. Drink – Drinking excessive alcoholic beverages, but too little water is a killing habit today. Our body needs 7-8 glasses of water a day! Our skin can’t like a plant – water goes straight to our skin and stores up for future use. Water goes through the stomach, then the intestines gets absorbed into our bloodstream and is filtered by kidneys. Then it hydrated our cells. Therefore you need to drink water in regular intervals; not only when you are thirsty; also not intake large amount of water in a short period of time because water just goes to your kidneys and urine. Apply effective skin care products to your face and entire neck area in your daily skin care routine. Keep good lifestyle. You will be thankful in your 40’s. Remember skin care products are not medicines; if your skin has serious problem, you must consult your dermatologists immediately.